We all want a faith that won't let us down in times of trouble or loss, uncertainty or fear. A faith that can pull us through the worst - and best - times in our lives. This is the kind of faith that James writes about. It is the faith that we practice day by day. 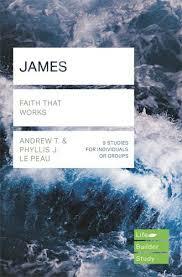 Studying James will help us grow a steadfast faith that can carry us through life. This revised Lifebuilder Bible Study features additional questions for starting group discussions and for meeting God in personal reflection, together with expanded leader's notes and a new "Now or Later" section in each study. This book contains nine studies and covers the Book of James, chapters 1-5.